As it should be Mr. Klukan, glad to hear it. Leaders bound by the same standards as those they lead. The Executive Branch has it right. Now all we need to work on are those “leaders” in the Legislative Branch, especially those in Congress. First off, thank you for your comment. In response to your specific question: NRC commissioners are, in fact, bound to comply, just as other NRC employees, with the Standards of Ethical Conduct for Employees of the Executive Branch. 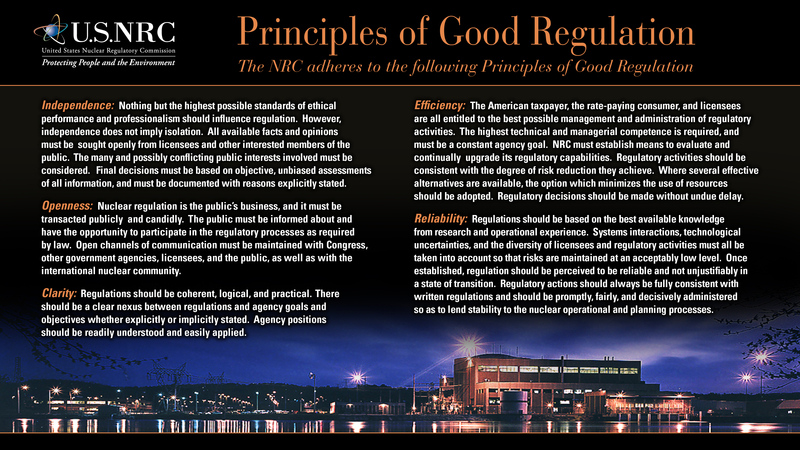 They include, among other requirements, the General Principles of Ethical Behavior mentioned in my post. I’ve verified this answer with other designated agency ethics officials at the NRC. Again, thank you for reading my post and providing feedback; I very much appreciate it. Are NRC Commissioners considered to be “executive branch employees”? If not, are they in fact bound by an identical principle by some other fiat? I have never had a problem with NRC employees working hard to be fair & impartial. But I feel that a few NRC Commissioners, past & present, have not been impartial in their deliberations & actions regarding the discharge of their duties. That in fact they have caved to pressure from the nuclear industry &/or pressures from congressional reps (including those in charge of NRC purse strings), influenced by the lobbying efforts of the nuclear industry , to help ensure the continued viability of the very industry they are charged with regulating. I would be interested to see if you can even respond to my concern, with even your own opinion on this subject, without fear of retaliation or retribution of any kind. First, gratitude for seeing you here! #gratitude to Sec. 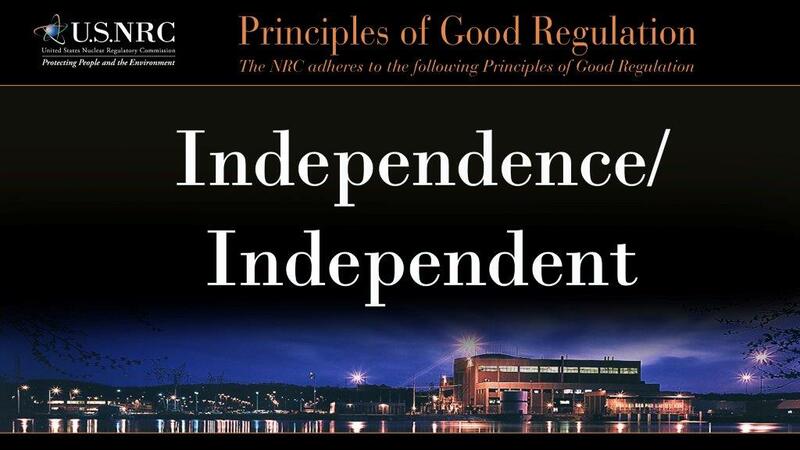 Perry et al., next “yeah” for independence, which probably creates some very interesting common ground to hold, in the regulatory position for the people and The People, and the Stakeholders and stakeholders of the corporations code interests too. Complex to establish that independent voice that honors equality like the #DavosPlanB did. Thank you for helping us understand the job and challenges of the NRC. Ultimately NRC should base its decisions on a strong technical bases weighed against the nations need for safe and secure nuclear power. The technical basis is impartial. The NRC is fortunate to have highly qualified staff that are more than capable of making decisions based on their technical merits. Walking the tight-rope described in the post simply results in inaction and blame shifting. Focus on the science and lets move forward.